Willy Adler was born in 1920 in Hamburg, Germany, to immigrant parents. His father had come from southeastern Poland and his mother, née Tella, was from Czernowitz, Romania, but they had become German citizens. As a child, Willy's father owned an egg store. Willy sang in the choir at the synagogue, and sometimes even "made a few marks" for singing. His father did not speak much German, so his parents usually spoke Yiddish. Willy grew up speaking both. 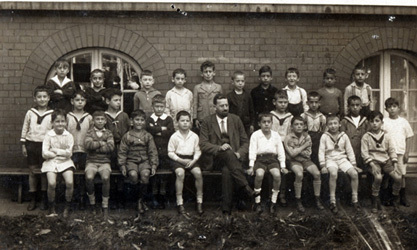 He attended school at the Talmud Torah Realschule, which taught kindergarten through grade thirteen (the school, reopened after the war, still invites him for a visit every year). Many of his old school friends and other acquaintances died in concentration camps. Willy remembers seeing the Hitler youth uniforms, thinking that they were so sharp, and wishing he could have such a nice uniform himself. 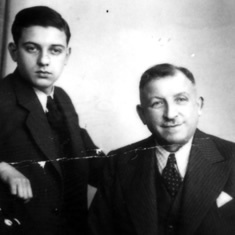 He was not able to finish high school because eventually Jews were forbidden to ride on the trolley cars, and like many other students, he no longer had a way to get there. In 1939, at the age of 19, he moved to the United States. Willy was a Zionist, and had been trying to get papers to move to Israel, but he also had a cousin in America, Morris Klinger, who provided papers for sixty or seventy Jews to immigrate from Germany and Poland. His cousin's help came through the fastest, so he ended up in the U.S. Willy's older brother David left Germany before Willy. Willy's plan was to follow along with his parents, but his father failed the medical examination, which was stringent at the time due to a tuberculosis scare in the U.S. His father had to wait nine months to undergo another test, and his mother remained in Germany while Willy traveled to the U.S. alone. A Christian couple, the Böhms, sheltered his parents for nine months until his father could take the lung x-ray again. This time he passed, and his parents were able to immigrate to the U.S. Until 1941, Jews could get out of the country as long as they could find another country to take them. Willy's cousin Morris lived in the Bronx, and set him up with a job in a fur shop. He made a meager $6 a week, but he had the comforts he needed. He stayed at the local YMCA, where he paid $1.50 a week for a small room (he called it a cubicle) with just enough room to sleep. He enjoyed it at the YMCA because there was a pool, nice bathing facilities, and plenty of other amenities to keep him entertained. During the week, bars had free lunch buffets, so it was economical to buy a nickel beer and eat the free buffet. Willy joined the American army during World War II and served for three and a half years. He was stationed at Camp Croft in Spartanburg, South Carolina (Henry Kissinger was in his battalion). Initially, he was trained for the infantry, but because he could speak German he was assigned to a job involving German war prisoners sent back to the U.S. through Charleston. After the war, he returned to New York and his old job. One day, Willy arrived at work to see picketers outside the fur shop. A man persuaded him to work for the fur union, and his salary increased to $15 per week. He kept this job until his wife became sick with emphysema—the doctor recommended he move to a better climate. In 1980, the couple first moved to Florida, but didn't quite feel like they fit in. They moved to Charleston, which Willy remembered from the army. Willy's wife lived for another seventeen years, and Willy lives in Charleston still. Although he was retired, Willy was restless and needed work to entertain himself. He had owned a restaurant for a short while in Brooklyn, so he got a job at Acme Restaurant Supply Company. Subsequent to this job, he helped open Berlin's Restaurant Supply, which is still in business today. Source: An interview conducted at the Jewish Community Center; Charleston, SC, August 13, 2008.